Blackhawk magazine pouches have a built-in tension spring, to hold your magazine in place until you need it and to allow the use of a variety of magazines in each pouch. The proprietary belt clip functions as a clip-on design but has the stability of a belt loop, thanks to the hold and strength it gets from its' aggressive talon and special Carbon-Fiber blend. 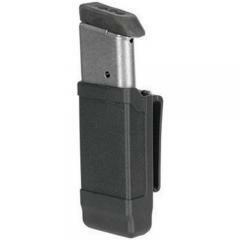 The single stack magazine pouch works with all caliber single column mags, from 9mm to .45 caliber. The double stack magazine pouch will take all 9mm and .40 caliber staggered column magazines, including polymer-body designs. The most interesting thing about these Blackhawk magazine pouches is that the unique belt clip can be removed and they can be placed side by side on our Dual Rail Accessory Platform, for those wanting a double magazine pouch, on the same carrier. Or, they can be placed beside one of our light carriers, for a combo light/mag carrier. Once again, BlackHawk® CQC® gives you choices, not limits. Very nice Mags. Slide in easy, but are retained very well. I am very happy with this product. The only thing better than having 8 rounds is having 16. This is useful because having a semi automatic, you never know when a double feed may occur. It's just easier to clear it by ejecting the magazine, racking 2-3 times and grabbing the extra one one the other side instead of try to hold the magazine that you've taken out while doing all that mumbo jumbo. I love these magazine pouches because they are affordable and they work , you can hang them upside down move them they stay I like them They are not meant to be dropped out of airplanes of course but as far as everyday carry you can not go better than these in my opinion and like I said in my other reviews I always have different systems that I like for different system setups but for all around carry you cannot beat this I will put my life on the line with any Blackhawk products. Jim USMC. Very good but awful difficult to clip on and off belt. Very impressed, you can hold upside down and shake and will not fall out. Holds the magazine very well. Looks good and fits well. Very durable. Fits great for Kahr 9mm mag, works great in use. Good solid carrier, would like it better if it was thinner. I bought two for the shoulder harness. They work great with the integrated rail system. Also work great independently with the belt clips. Great product at a great price.